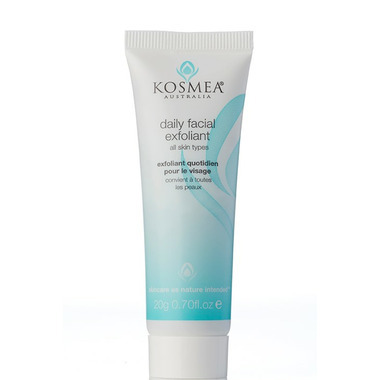 Kosmea Daily Facial Exfoliant is a gentle, daily facial exfoliator to reveal skin's natural vitality. Use daily after cleansing. Massage into slightly damp skin and then rinse of with water. For a deep-cleansing facial treat, leave on skin for 5 or more minutes and then rinse thoroughly. Ingredients: Crushed rose hips - gently lift off dead skin cells and improve circulation. Chamomile flowers - gently exfoliate the skin without harsh scrubbing, and act as an antibacterial agent. Rice Flour - rich in proteins to soften, nourish and moisturize skin. Koalin clay - a natural clay renowned for its skin detoxifying benefits and its ability to draw out skin impurities. This is a nice product but I took off one star because it is hard to squeeze the cleanser out of the tube - the grit in the exfoliator is plugging up the little hole. Otherwise, nice gentle cleanser, with enough grit to give my skin a good scrub.